Where in the World is Alexander Glover (1756-1826)? Researching before the first United States Federal Census in 1790 finds researchers using other records that place our ancestors in a specific locale. This is where one must search for land records, military records, jury lists, and other records. I have been compiling my "Where in the World" series for awhile now. Currently, I am to the point where I need to add records besides census ones. The table below is for my fourth great grandfather, Alexander Glover, who married Sarah Salisbury. 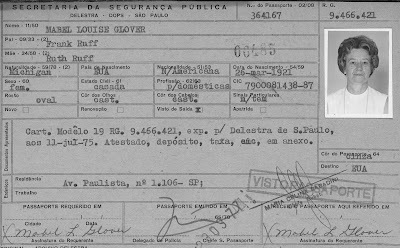 Watching the Rio 2016 Olympic Games reminded me of the time my Uncle Hank Glover and Aunt Mabel (Ruff) Glover lived in Brazil. 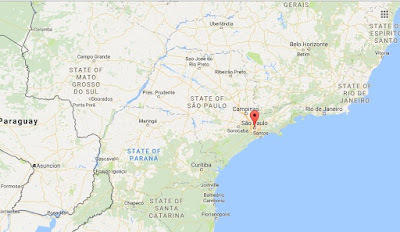 My uncle worked for General Motors and after having spent time in South Africa, he was sent to work in Brazil. They lived in Sao Paulo, Brazil for a few years. I remember when my uncle and aunt were in Brazil. They visited once or twice while there. I have a purple amethyst and yellow topaz from Brazil that they gave me. 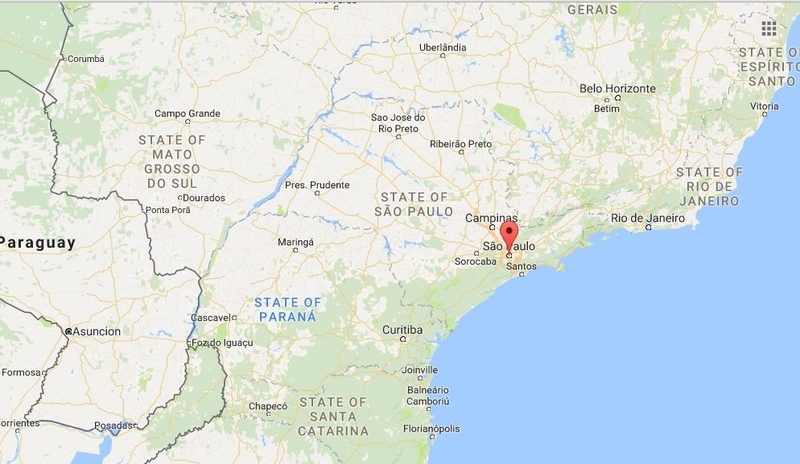 My aunt and uncle enjoyed living in South Africa, but didn't find Brazil as nice. I remember my aunt talking about the lizards on the walls. Conditions were not like they were use to. 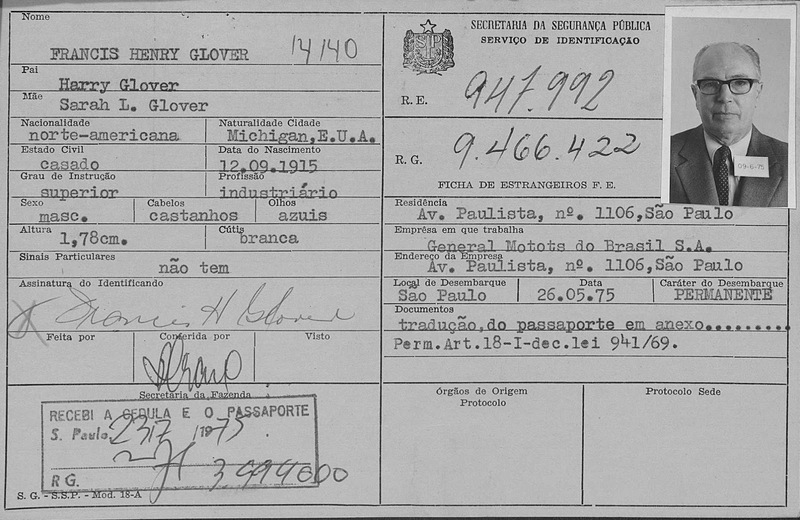 Family Search has a record group: Brazil, São Paulo, Immigration Cards, 1902-1980. 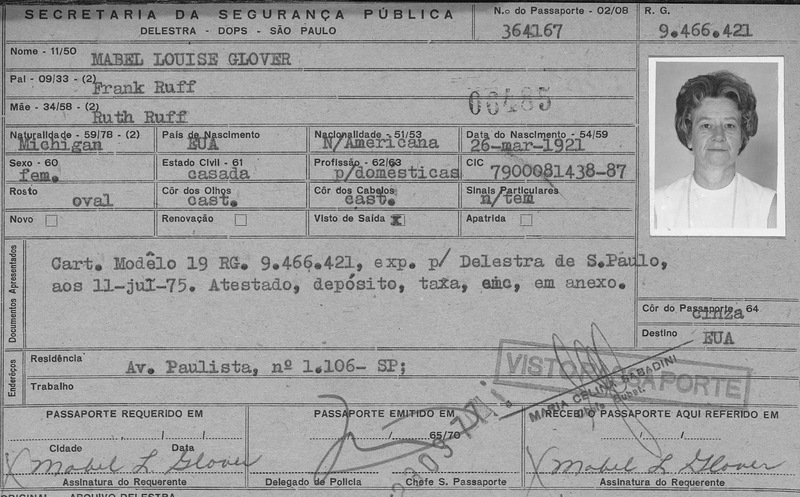 This record contains "registration cards for foreign citizens with permanent residency in São Paulo, issued by the Office of Public Safety and housed at the Arquivo Público do Estado de São Paulo", according to the Family Search description. Below are the cards for Francis Henry Glover and Mabel Louise Glover. 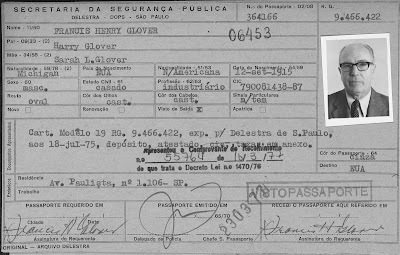 Source: Brasil, São Paulo, Cartões de Imigração, 1902-1980," database with images, FamilySearch(https://familysearch.org/ark:/61903/1:1:Q2S7-XMR8 : 3 June 2016), Francis Henry Glover, 1975; citing Immigration, São Paulo, São Paulo, Brazil, certificate , registration , Arquivo Público do Estado de São Paulo (São Paulo State Public Archives, São Paulo). 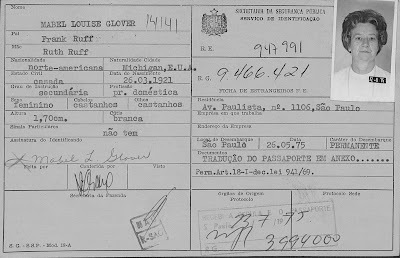 Source: "Brasil, São Paulo, Cartões de Imigração, 1902-1980," database with images, FamilySearch(https://familysearch.org/ark:/61903/1:1:Q2S7-XMB1 : 3 June 2016), Mabel Louise Glover, 1975; citing Immigration, São Paulo, São Paulo, Brazil, certificate , registration , Arquivo Público do Estado de São Paulo (São Paulo State Public Archives, São Paulo). 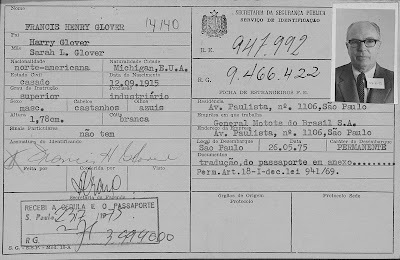 Source: "Brasil, São Paulo, Cartões de Imigração, 1902-1980," database with images, FamilySearch (https://familysearch.org/ark:/61903/1:1:QVV9-HK93 : 3 June 2016), Francis Henry Glover, 1977; citing Immigration, São Paulo, São Paulo, Brazil, certificate 9466422, registration 364166, Arquivo Público do Estado de São Paulo (São Paulo State Public Archives, São Paulo). 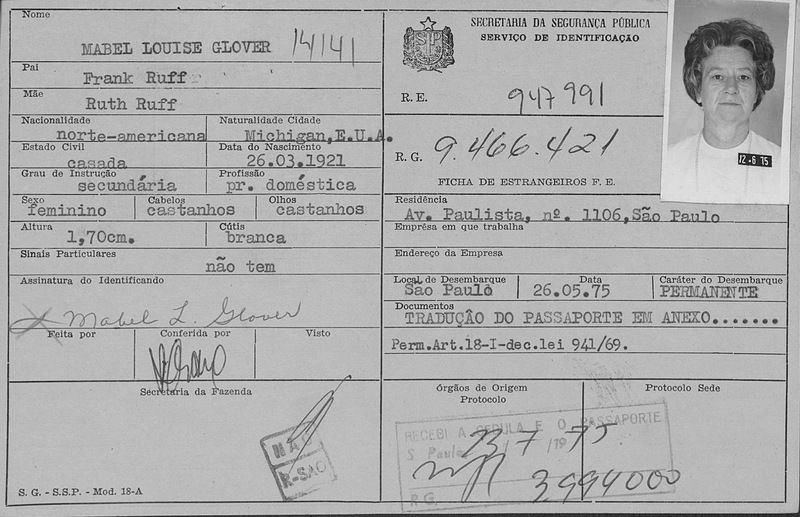 Source: Brasil, São Paulo, Cartões de Imigração, 1902-1980," database with images, FamilySearch(https://familysearch.org/ark:/61903/1:1:QVV9-HSJ2 : 3 June 2016), Mabel Louise Glover, ; citing Immigration, São Paulo, São Paulo, Brazil, certificate 9466421, registration , Arquivo Público do Estado de São Paulo (São Paulo State Public Archives, São Paulo). I knew a lot of the information on this record already but the information provided here is great for genealogists. 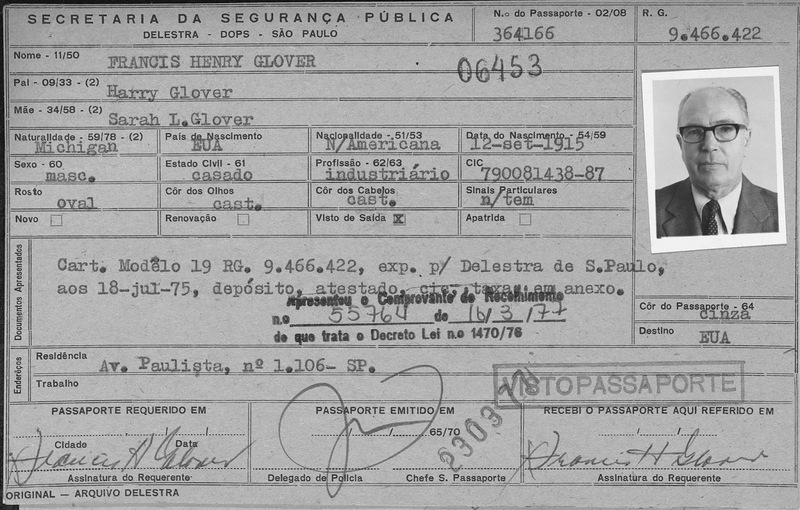 One note: Francis Henry Glover listed his mother as Sarah L. Glover. Sarah L. Glover was his step-mother. Francis Henry Glover's biological mother was Emma Winkler, who died shortly after giving birth to Francis. This is a piece of family history that brought back fond memories of my aunt and uncle. They were both very loving, caring and special people. It was nice to see their pictures and information from a time I remember. Land records can provide relationship information on our ancestors and I wanted to make sure I didn't overlook these important records before I head to New England to conduct research on my Fenn and Rowley family. Specifically, I was looking for Daniel Fenn's and Hopkins Rowley's Vermont land records. I am trying to identify the parents of Daniel Fenn, who married Huldah Rowley, and to provide proof for Hopkins Rowley being the father of Huldah. 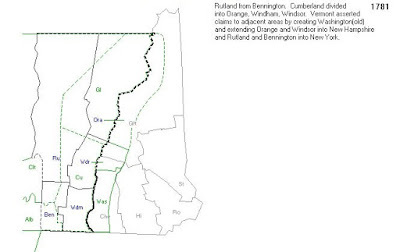 Research already conducted shows Daniel Fenn and Hopkins Rowley in Pittsford, Rutland, Vermont and Shoreham, Addison, Vermont. 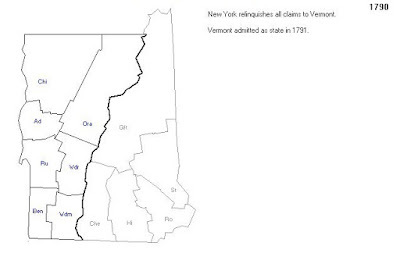 First place I went to look for Vermont land records was Family Search.org. I ordered the following land records. Microfilm No. 28689-Pittsford, Vermont Index to Land Records (1770-1951) and Vol. 1, 1761-1790. I photographed (old microfilm machines at my local Family History Center) the pages of Fenn's and Rowley's that bought or sold land. I went home and compiled a Deed Index chart for each surname and location and ordered the land records I needed. I ordered the following land records. Microfilm No. 28690-Pittsford Vermont Land Records, 1787-1801, Book 2,3. Microfilm No, 28957-Shoreham Vermont Land Records, 1812-1822, Vol. 5,6. I spent hours going through these land records at my local Family History Center that is only open four hours a week. One of the Shoreham volumes was so frustrating because the microfilm pages did not show the page numbers, so I am sitting there counting page by page and finding one and having to start counting from there. I had to do this volume in two trips because I was getting a headache from concentrating so hard. It might have been my bifocals, who knows. I found land records for Daniel Fenn and Hopkins Rowley. Hopkins Rowley even sold land to Daniel Fenn. I was so hoping for information about their relationship, but no luck. I did find a couple of instances where Hopkins Rowley sold land to his sons, which was stated in the document, Silas and Myron Rowley. Now, if I could prove Silas and Myron were the brothers of Huldah, I would be happy. Finding Daniel Fenn's parentage is going to take further research, but I found a few Fenn names in early Pittsford, Vermont that look promising. Occasionally, I would find evidence of previous residences. 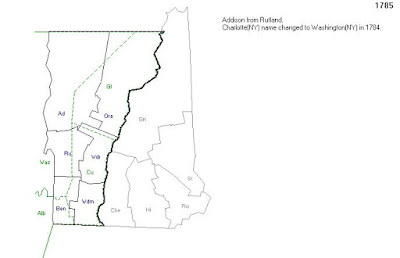 For example, Jonathan Rowley of Richmond, Berkshire, Massachusetts bought land in Pittsford, Vermont in 1773. Jonathan Rowley is the father of Hopkins Rowley. This was the first time I saw a record showing Jonathan Rowley having a connection to Richmond. I haven't transcribed all the land records, but that is the next thing I will do. I want to have it done before I leave for New England. I have left land records for later in my research and I would encourage researchers to look at them sooner, maybe right after using Census Records. It helps place a specific person in a specific place. In addition to providing locale, land records can provide relationship information. Land records are some of the most important records researchers can use when conducting good genealogy research. You never know what you will find in land records, so don't overlook them. 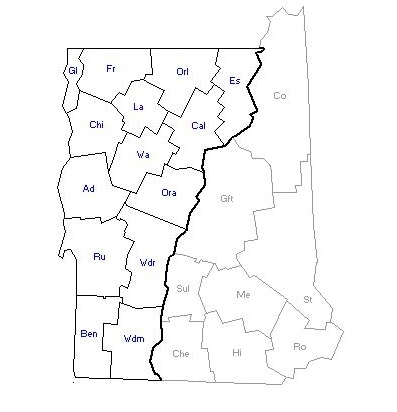 It is important to understand the formation of states and counties when researching your family. Historical maps can help one in understanding this information. 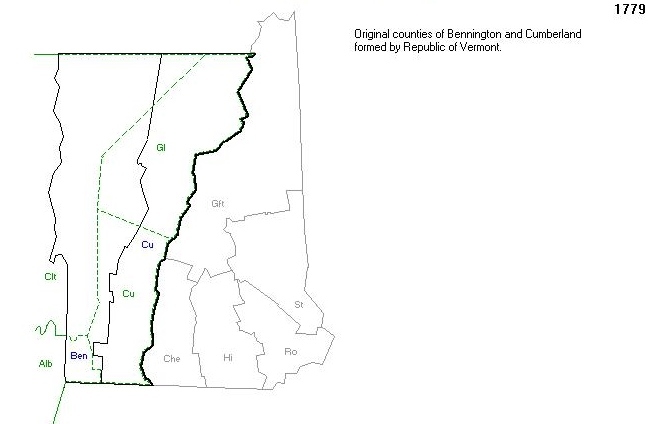 I used the information found at mapofus.org and created a timeline for Vermont and its county formations. 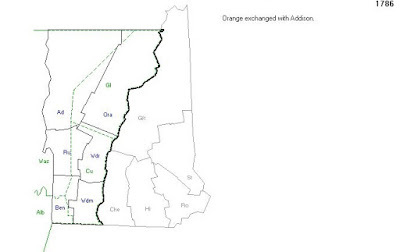 Cumberland County is divided into Orange, Windham, and Windsor. 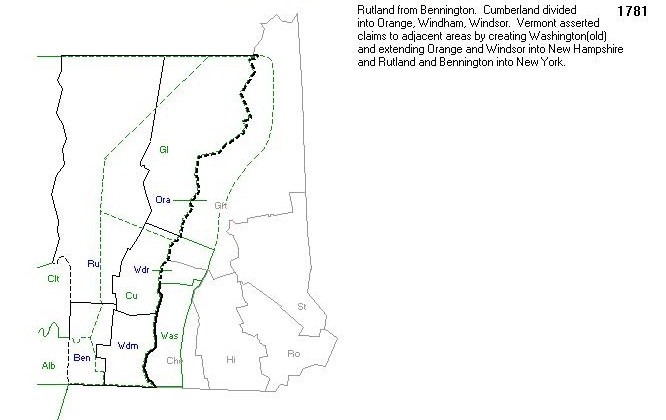 Vermont asserted claim to adjacent areas by creating Washington County and extending Orange and Windsor counties into New Hampshire and extending Rutland and Bennington counties into New York. 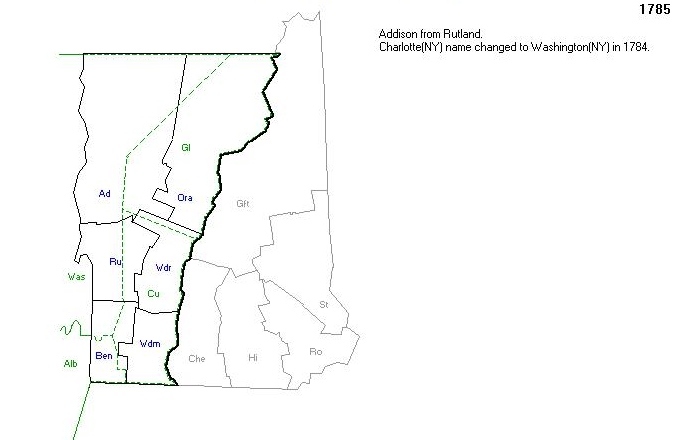 1785-Addison county formed from Rutland County. 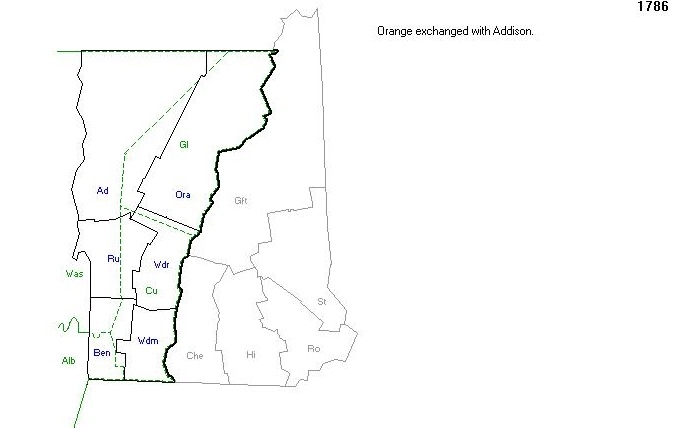 1786-Orange county exchanged with Addison. The wonderful information and screenshots of maps were provided from mapofus.org. If you haven't checked this website out, you need to. It has each U.S. state and its history in map form. Each state has its own page with animated maps showing the changes throughout the years. There is a map showing the formation of the United States, a couple of military maps, and historical atlases on this website as well. This website should be in every genealogist's toolbox. City Directories can be a great source of information on the residences of our ancestors. My ancestor Samuel Stillman Glover left Michigan around 1848 and tracing his whereabouts was made easier by the federal census records, but that only gave me information for 1850 and 1860. What about the other years? This is where city directories can be your friend and if they are available online, even better. Samuel Stillman Glover died 30 May 1870 in Rochester, New York. Often lists the names of person, spouse, family members and their residence. Helpful in finding information about the occupation of your family member. Can narrow down the immigration year of ancestor. When did your ancestor first appear in the city directory? Great for finding people in larger cities, especially if they didn't own their own home. Helps to know exactly what years your ancestor lived and worked in a certain place. Leads one to business advertisements that your ancestor may have placed in the directory. Leads you to area churches, schools, hospitals, funeral homes, etc, where you can look for more records. May list death information that occurred that year. It is a great place to check for other family members with the same, or different surnames. Local Libraries-Check the local or state library in your area for online city directories. I have found many libraries have them digitized and available for researching. 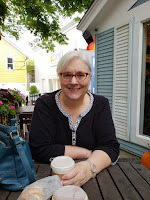 A fellow Michigander, Jasia, wrote an excellent series of ten blog posts about using City Directories at her award winning blog, Creative Gene. I suggest to take a look at her posts, which are filled with a lot of helpful information. 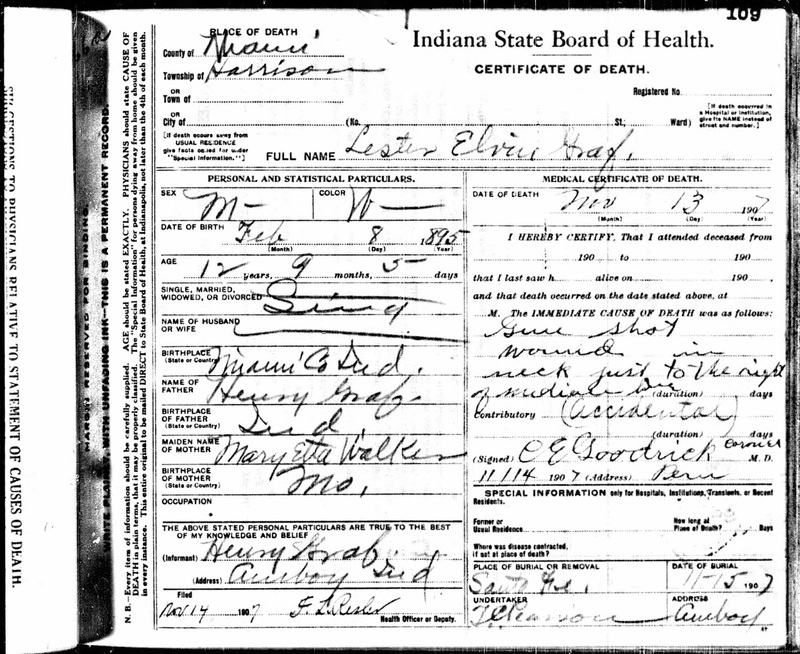 Death certificates provide a lot of information of genealogical value and may lead to more places to research. 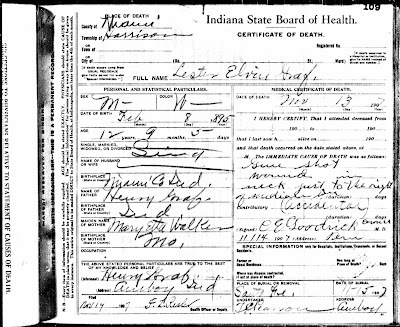 The above death certificate is from the recently released Indiana, Death Certificates, 1899-2011 at Ancestry. The cause of death for Lester Elvin Graf, the son of Henry Graf and Mary Etta Walker, was gun shot wound. Fortunately, it was listed as accidental. The year was 1907 and the place of death was Harrison Township, Miami, Indiana. I looked for his obituary or newspaper article at Genealogy Bank, but nothing was found. I have added it to my to do list as I am sure there would have been coverage of such an accident in 1907. It is important to read every line of vital records and look for clues that will lead to other records. I will let you know what I find. 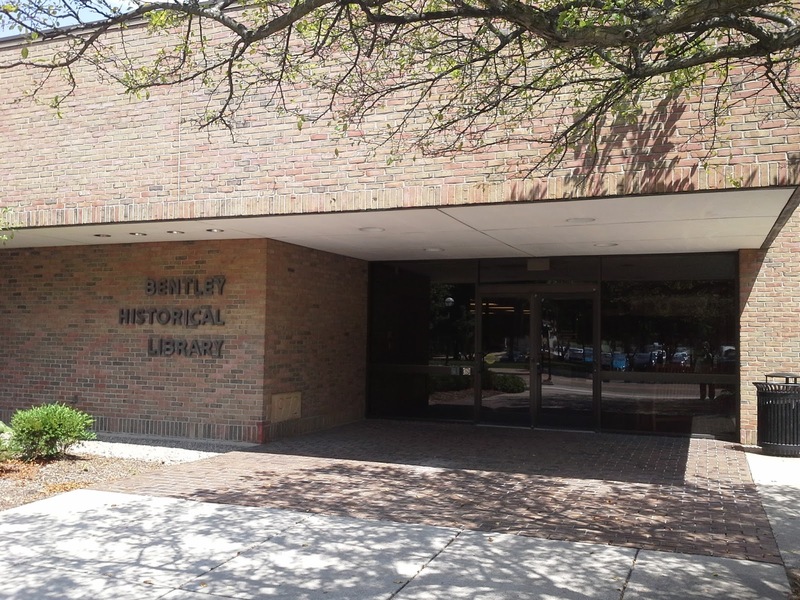 Researching at a university library may not be the first place genealogists think of for finding family history records, but I have had researching at the Bentley Historical Library on my genealogical research trips-to-take list for a couple of years. Finally, I went. Bentley Historical Library is on the campus of the University of Michigan in Ann Arbor, Michigan. 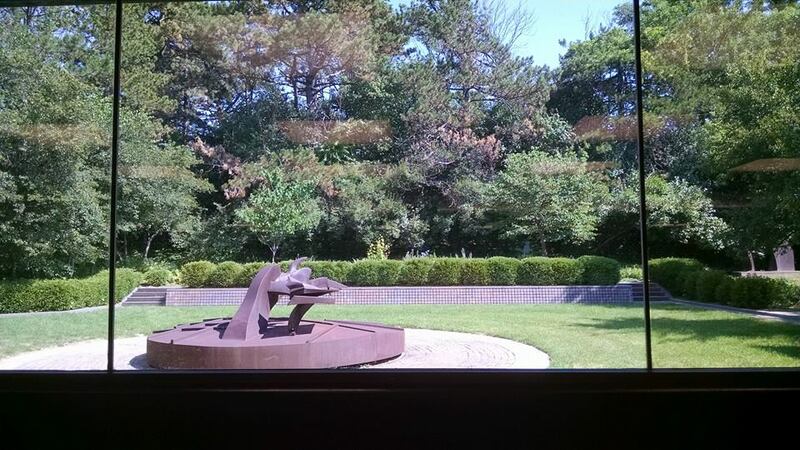 It was a beautiful summer day and the view from the windows of the library was enjoyable. There are a few things researchers need to know before researching at the Bentley. Request an online research account before going. This isn't mandatory, but it will save you time if you do. You will have to create one when you get there, so you might as well do it at home. Requesting an online research account is easy. You go to Register for a Research Account to request it. Create a "New Reading Room Request" for materials you are interested in viewing. Once you are all set up with a research account you can create this request by using their online card catalog "MIRLYN" You can request materials from home, or any computer, or in the research room. I chose to create my list from home and print a copy to take with me. Some materials are stored offsite. Requesting materials ahead of time lets you know when your materials are available for viewing. Read the Reading Room Rules. Knowing ahead of time what you can and cannot take will save you the trouble of lugging materials that aren't allowed. Lockers are available, if needed. 4. 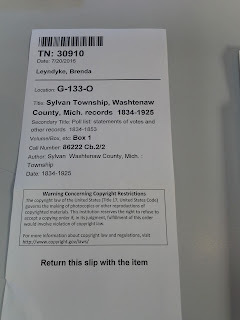 Arrive at Bentley Historical Library, 1150 Beal Avenue, Ann Arbor, MI 48109. The library is located on the North Campus of the University of Michigan. Parking is free and next to the library, south side. Check in at the Reference Desk to the left of the entrance as you enter the research room. Tell staff what records you would like to have pulled for you. The staff will get them and bring them to your table. 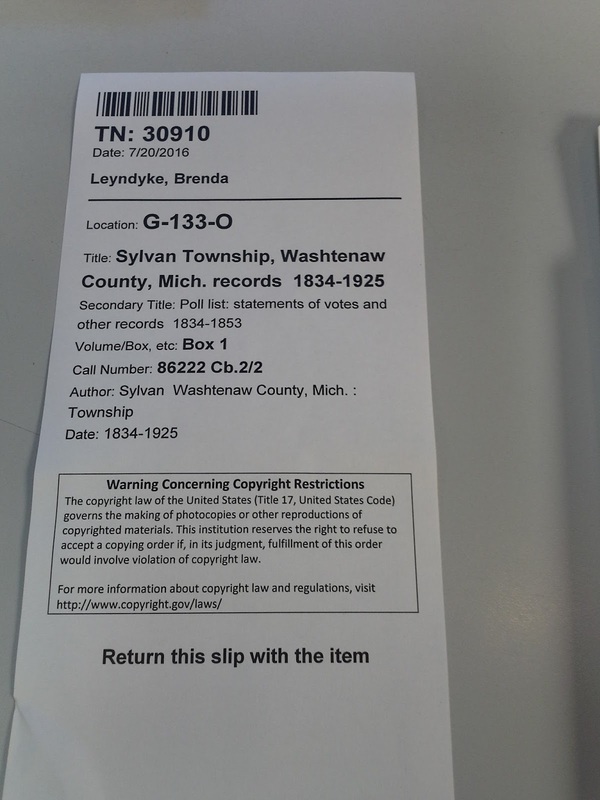 Staff will stop retrieving your material 30 minutes before closing time. Pull slip that came which each delivery of records to the table. I photographed it first as a reference for what records were to follow. A great guide for source information, too. 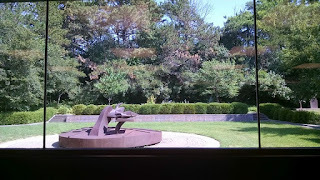 I found the Bentley Historical Library to be a wonderful place to research. What is it about University campuses that exude such energy? Requesting materials went smoothly. The staff is very responsive to emails sent. One staff person contacted me because I had requested an inter library loan (ILL) record and she was clarifying if I needed it, as she saw I had requested other materials for onsite research. Yes, some of there materials are available for loan. My view while I waited for records. I cannot say enough good things about the staff. Everyone was very friendly, professional, and helpful. The day I was there, a Wednesday, researchers filled about seven tables. I never waited more than a couple of minutes for my records to be pulled, except once, which was a 30 minute wait, but they warned me about it at the time. It was around lunch time and I guess they were accommodating everyone's lunch time. One item is pulled at a time and brought to the table. 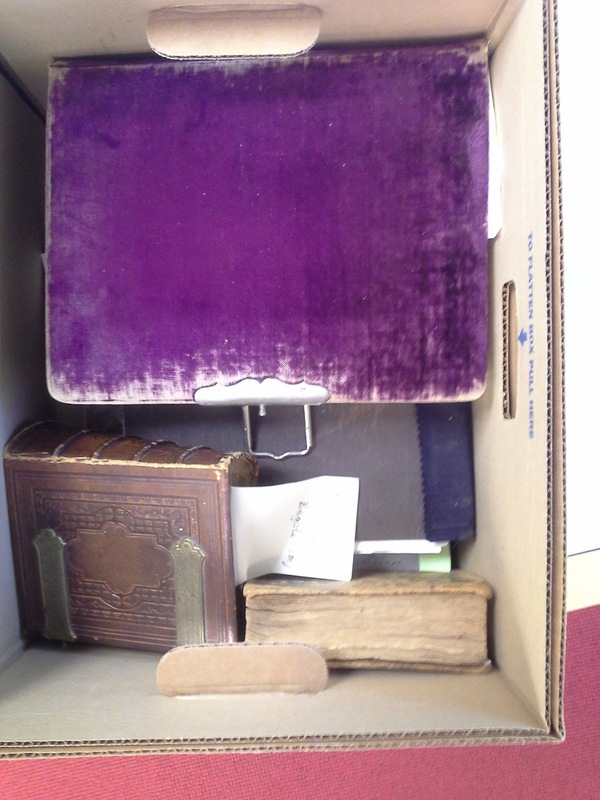 My materials consisted of books, folders, and boxes of material. I was never so happy when I opened one box to find four scrapbook/photo albums. I took a note book with my list of references, my driver's license, a couple of pencils, a pen, source sticky notes, research logs and my tablet with me. It was all that I needed. I had my research on my tablet for handy reference, if needed. I arrived around 10:15. a.m and left about 3 p.m. I didn't break for lunch, but there is a room available for sack lunch-ers, if needed. I had requested 15 items before I went. I was able to get to 13 of them, before I called it quits. 1824-1974 A trail through time, 150 years, a brief history of the Dexter area. 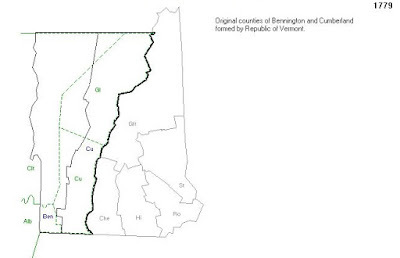 The main reason I went to the Bentley was to find information on my Daniel Fenn family before I head to New England. I am trying to exhaust all 'local' records before I leave, freeing up my New England time to search for records only available in New England. 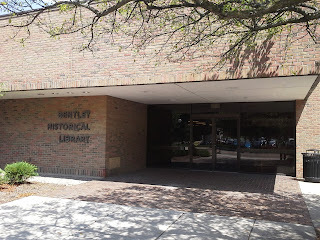 Bentley Historical Library is a great place to research for Michigan ancestors and more and with a little planning it can be a very successful trip. Be sure to add University Libraries as a repository for researching your ancestors. I am glad I did. Are You a Gatherer, Grower or a Genealogist? I do a lot of thinking when I am working in my gardens. One day I was thinking that gardening is like genealogy. You grow and gather when gardening. You grow and gather in family history. I started researching my ancestors with very little knowledge of what I was doing. I would jump from one web page to another and just grab all the information on my family that I could. I didn't save where I got the information from. I didn't evaluate the information, I just gathered it! I wasn't happy researching this way. I would look at my research and think, "Now, where did I get this from?" It led to a lot of frustration and confusion because I could not go back and find the information I had gathered so carelessly. Was this Jonathan, Sr. or Jonathan, Jr.? Who knew? I decided a do over was needed. I decided I needed to get serious about my research and do a good job with it. If I was going to spend hours and hours of researching I wanted to be proud of my work. I researched genealogy software and decided on Roots Magic. I checked how-to books out of the library, I read online how-to articles, I attended workshops, I joined my local genealogical society and I started watching webinars. I started growing as a researcher. The more knowledge I gained the more I grew as a researcher. I learned about how to conduct solid research, how to analyze sources, information and evidence. I learned about the Genealogical Proof Standard, I even printed a "Does It Meet the GPS?" card and placed it on my desk. I started a blog! I learned a lot about genealogy. There has been discussion in the past about who can call themselves a genealogist and I don't want to get into that controversy, but Merriam-Webster defines a genealogist as a person who traces or studies the descent of persons or families. I believe this definition should be taken a step further and add "using sound research practices." I am proud to say I am a genealogist. I didn't become one overnight. It has taken years to get to the point I am at. I am no longer a gatherer. I save the record and the source for everything! No more wondering where I got that document. I have grown as a researcher over the past ten years. Does that mean that I no longer continue to grow. No, but now I am growing as a genealogist. I still read books and articles, attend workshops, and watch webinars. I am still a member of my local society and three others. I am President of my local society. I have taken the knowledge I have obtained and have spoken to societies. I am on the board of the Michigan Genealogical Council. I am continuing to grow, the difference is that I am doing it as a genealogist. How about you? What type of family history researcher are you?